(From left) Passionist Fathers James Wood, Jim Elmore, Jose Sanchez and Ray Brain at "The Fort"
IN August 1956, a small group of men established a northern outpost for Passionist priests in Brisbane. In doing so, they also began a tradition of community worship at “The Fort” that has lasted 50 years. 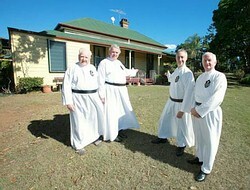 This weekend “The Fort”, in Fort Rd, Oxley, celebrates 50 years as a Passionist community. Although not a parish, the Passionists have offered Sunday Mass to the surrounding community since they arrived in 1956. Despite the name, there has never been any formal military connection with the property. The Passionists have a long association with south-east Queensland. Missionaries from the Italian province of Passionists had worked on Stradbroke Island with Aboriginal people as early as 1843. Walter Coxen, an early owner of the property on which “The Fort” is now located, first viewed the land from the Brisbane River while travelling to Ipswich. Its location high above the river reminded him of a similarly positioned fort in Bombay, India. He bought the property in 1873 and built the current residence. He dubbed it “The Fort”. When the Passionists established their community on the property in 1956, they named it Regina Coeli Retreat, later renamed St Mary’s Retreat, the official title today. But to those who have lived and worshipped there over five decades, it has rarely been called anything but “The Fort”. Walter Coxen had created a grand homestead with 15 rooms, including six bedrooms. After taking up residence in 1956, the Passionists added four bedrooms and a shower and toilet block to cater for the growing number of visiting priests who stopped at Oxley en route to missions in the South Pacific. At one time – following the closure of Fort Lytton in the 1950s – two large metal cannons were placed in the gardens. But they were removed in the early 1970s, shortly after Fr Austin Kenny accidentally drove the rider mower into one of the barrels. He later declared them to be inappropriate for a religious site. But while the “The Fort” derives its name and identity from the real estate it occupies, it has been the Passionists who have been and remain the mainstay of the community. In 50 years, “The Fort” has been home to dozens of priests. Some have stayed for a short time, while others have made a more permanent home in the community. Each has, in his own way, added to the story of “The Fort” and to the fabric of the community that gathers there. One of the original Oxley Passionists, Fr John Cummins, oversaw a major project to connect water to the fledgling community from Oxley station, several kilometres away. Fr Aiden Kay spent hours in the early 1980s trying to bring order to the property’s expansive gardens. The peaceful oasis he created near the kitchen still bears the nickname it was given at the time by his brothers, “The Garden of Aiden”. The cheerful Fr David Wilkie was the first to invite worshippers into the communal home for a spot of bonhomie on special occasions. The celebrations he began with a cask of wine and some snacks after the Christmas Eve and Easter Vigil Masses continue to this day, albeit on a BYO basis to cater for the much larger congregations. It was on those occasions that “The Fort’s” congregation began the transition from Sunday worshippers to a community of friends. These moves were formalised in the 1980s by Frs Brian and Paul Traynor, who introduced the Family Group Movement. The family camps and “extra-curricular” activities that they introduced to “The Fort” continue today. NSW-born Fr Peter Gardiner risked the ire of Queensland footy fans with regular taunts from the pulpit at State of Origin time. Fond of betting on the football result, Fr Gardiner handed out dozens of Cherry Ripe chocolate bars to happy parishioners on Sundays after the Queenslanders had enjoyed a win, and watched the collection baskets fill with the shiny red wrappers after a Blues victory. It was a wager with a member of the community – a firefighter – which saw Fr Gardiner standing on the driveway being hosed with water from a fire truck one teeth-rattling Sunday morning following a Blues defeat. Fr Ray Sanchez created evenings of beautiful music under the stars, with the lights of the city as a colourful backdrop. Fr Vianney Carey ended every sermon – and most conversations – with the beautiful and heartfelt promise that “Jesus loves you”. All of them have helped make “The Fort” a strong community of worship and friendship. Growth in the size of the community in the early 1990s saw the Sunday Mass relocated from the chapel in the residence to “The Shed” at the rear of the property. “The Shed” was, in fact, part of the stables for the original property built by Walter Coxen. It was relocated when the Passionists took over “The Fort”, and has been renovated on a number of occasions, including after two fires – the most recent of them last December. Last December’s fire forced the temporary relocation of Sunday Mass back to the residence. Despite the improvements to the building over the years, “The Shed” has never lost its unpretentious name. Newcomers may be surprised to hear that Sunday Mass will be in “The Shed”, but they soon get used to the idea. Those who join “The Fort” community in worship for the first time soon realise that while the building may be unconventional the bonds of community are as deep as any other. As with any “fort”, there is tremendous strength and endurance – not in the physical buildings but among those who join in worship and those who lead it.